We have already seen how this can be interpreted in so many ways by the Creative Guides and our first guest of the month - Sara Emily. 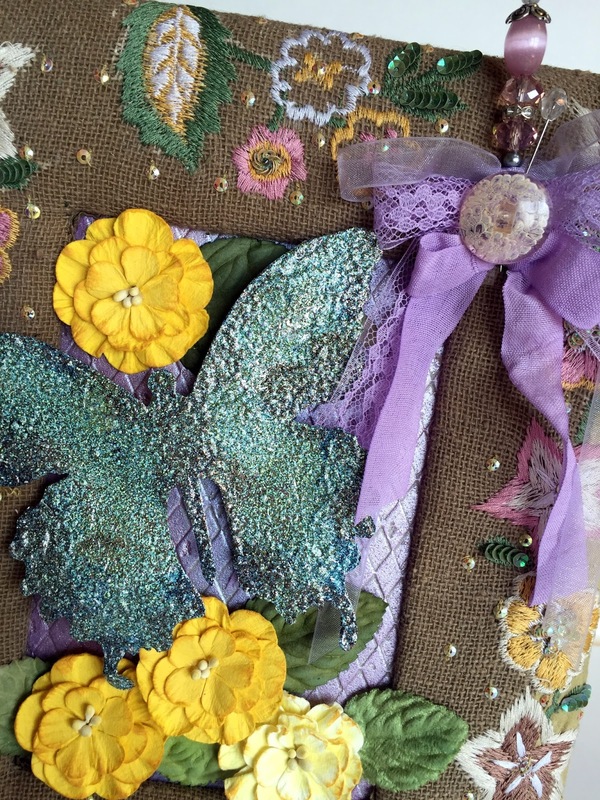 Don't forget we now welcome a number of genres - vintage, shabby, mixed-media, art journaling, industrial and steampunk - so you have great scope to express your creativity. Let's see what Autumn, Nicola and Alicia have created! I am married to an amazing man, and my biggest supporter. We have four children, yes four! I work full time as a church secretary. I have been stamping for over 15 years. Creativity is my outlet, passion and purpose. I define my style as grunge meets elegance. Though I love to distress everything, I like to balance my work with a touch of pretty and neat. In addition to stamping, I love to draw and paint and have found that mixed media allows me to blend these skills and create rich artwork, filled with depth and texture. 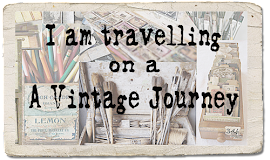 I couldn't be happier to be joining A Vintage Journey for their birthday celebration! Happy birthday AVJ and thanks to the DT for the brilliant inspiration thus far! I used Tim Holtz's darling little girl as the focal point for this watercolor collage on canvas. She is layered on burlap and a "rusted" corrugated panel. I used one of Tim's tiny layering stencils to create texture and depth in my background. This new floral stencil is quickly becoming my favorite! A close up of the rusty treatment, with all the details to be found on my blog, SewPaperPaint. Hello. 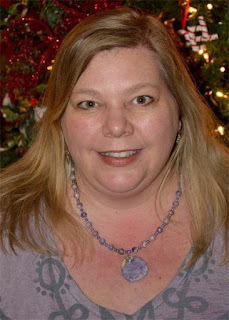 I'm Nicola (aka Paper Profusion) and I'm thrilled to be a guest designer again here at A Vintage Journey. 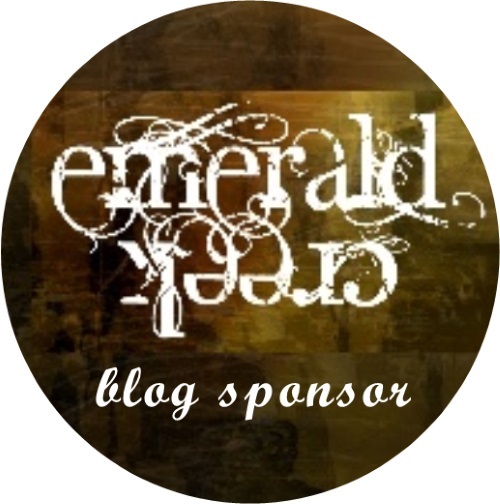 It's always wonderful to have the opportunity to feature at one of my favourite blogs - very many thanks to Brenda and team for inviting me. I was delighted to have won the first ever AVJ challenge so it's additionally pleasing to feature again in the month of it's 2nd Birthday. I was a tad alarmed when I learned the travel bag 'ingredients' to include in my project. Metal item, rust effects and board substrate were no problem but lilac! Yikes! I'm not overly fond of that particular shade. I was happy though to learn that AVJ have broadened their guidelines so that inspiration may be taken from any artist, provided that the vintage genre etc. is adhered to. I'm not sure how I ended up making this particular project but I set out to create in the style of Frank Garcia (Prima Designer) whose projects I love. 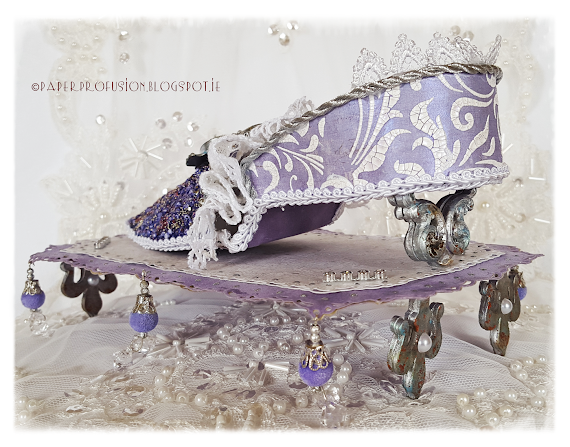 I've used cardboard, for both the shoe sole and the ornate stand, sandwiched between layers of paper by Maja Design and SEI Velvet. 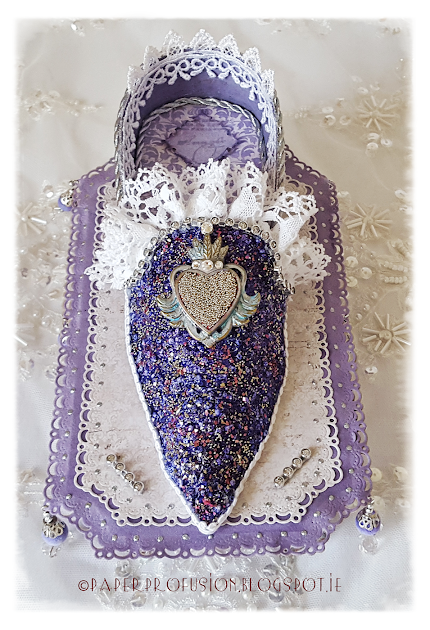 The shoe upper is made from Tim Holtz grungepaper as it was ideal to hold all the layers of gesso, inks, sprays, beads and glitter that were applied, as well as being easy to shape. Added oodles of lace and bling, including a lovely metal bezel that I've aged faux silver. The 'heel' was white polymer clay and the stand feet are chipboard diecuts that I've altered to look aged and slightly rusted. Painted some of the paper surfaces with Twinkling H20s as it gives a satin like shimmer - similar to fabric shoes from the Marie Antoinette era. Tim Holtz's flourish stencil worked a treat with crackle paste. Unfortunately shoe comfort and safety levels cannot be guaranteed - despite the centuries, some things never change! Huge thanks again to the über-talented ladies at A Vintage Journey for inviting me to guest design. Whilst I worked on this piece I mostly thought that I never wanted to see the lilac hue again but the strange thing is that it's started to grow on me! 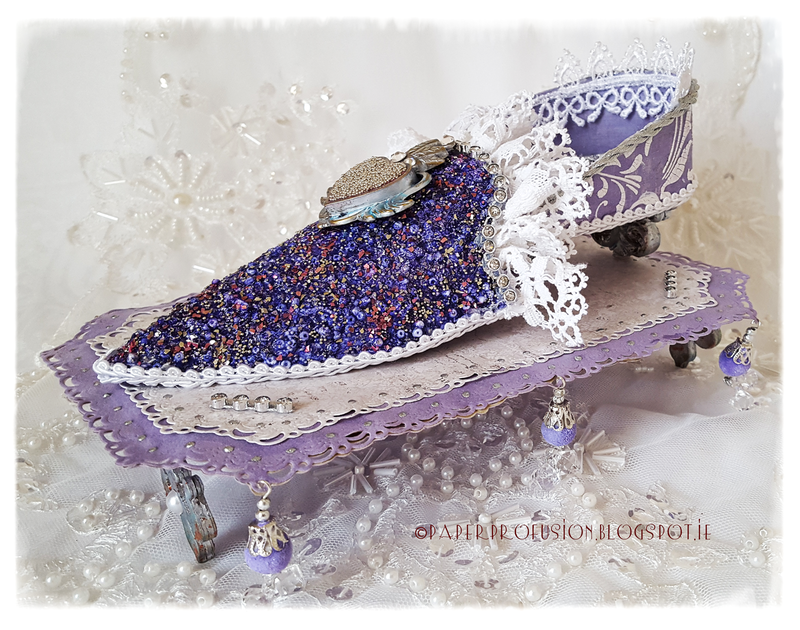 If you would like to see more photos and details, including shoe template source, please pop over to my blog. Hi, My name is Alicia O'Bryant and I am a wife and mother to one son, one stepson, one dog and 2 turtles. I live in the U.S. 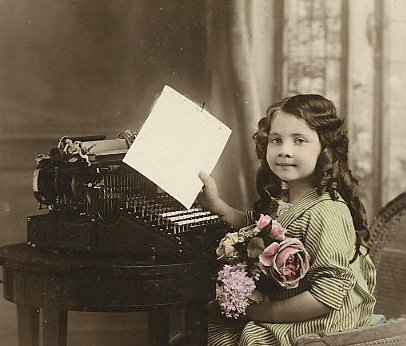 I have been crafting since childhood. For many years I created and sold beaded jewelry, in more recent years I have moved to paper crafts. 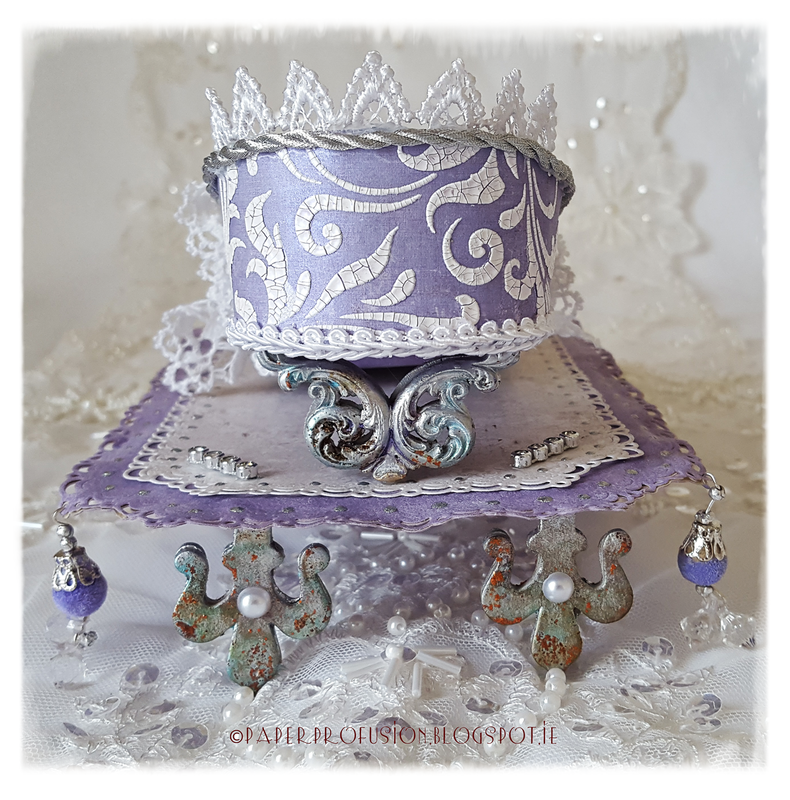 You can see my latest work on my blog Golden Goddess Designs. 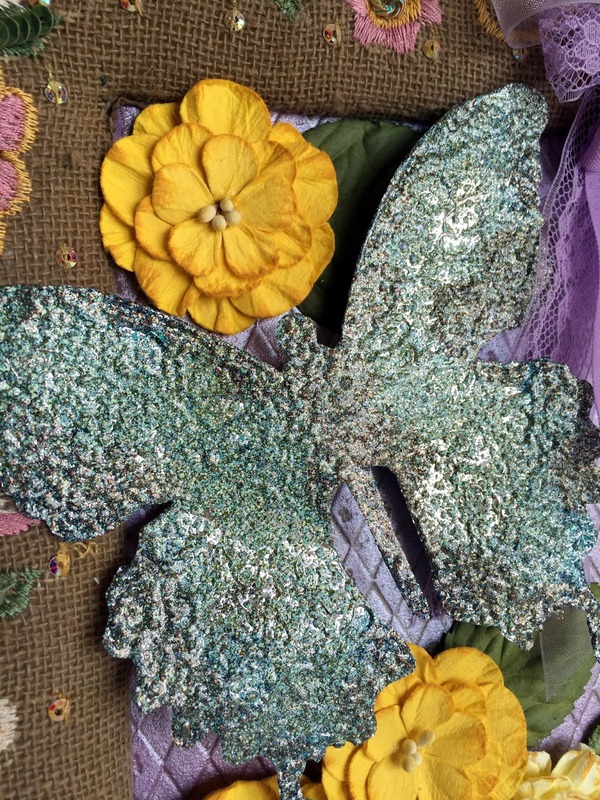 I enjoy mixing media as you can see on the project I made for A Vintage Journey today. 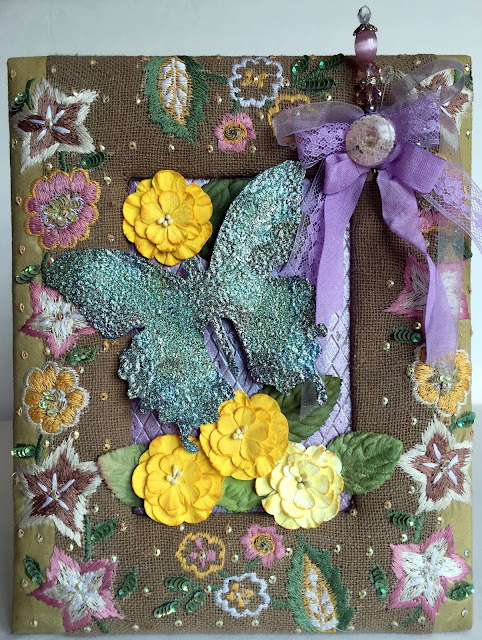 I started with a harlequin piece of Tim Holtz grunge board this month's substrate. I inked it with a multi color pigment ink pad, Brilliance twilight a combination of pearly lilacs and lavenders, perfect for the color in this month's travel case. Two ingredients down and two to go. The next two ingredients are metal and rust. I took a cue from last month's tutorial and created a butterfly with Judikins Rustique embossing powder. I have more detail on my blog post about this project. 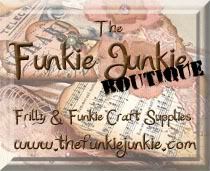 I started with heavy duty aluminum foil die cut and embossed with a Tim Holtz matching set. I used embossing ink and layered two different colors of Judikin's rust effect embossing powder: azure and jade. I then needed to find a way to combine the two parts of my project. I thought a nice frame might work and rummaged through my stash. I love this old frame and I am so happy to give it such a nice new life! It also gave me the idea of a "garden" since it was already full of greenery and flowers. I cut down the grunge board to fit the frame and started to embellish. I wanted to pull more of the colour in this month's travel case so I added several different lilac ribbons and fibers. I tied them together with a pretty button and stuck in some pins I received in a swap. Thanks so much to A Vintage Journey for having me as a Guest Designer this month! Thank you ladies! Two beautifully created, but very different canvases from Autumn and Alicia and the elegance of Nicola's shoe - just goes to show how this theme can be used in so many ways! We look forward to seeing your creations! We will be back on Monday with another Destination Inspiration post. such great projects! thanks so much for having me guest. AMAZING projects from our 3 guests!! Just incredible, thank you so very much for sharing your inspirational projects with us, they are all incredible!! TOTALLY with Astrid on this Autumn, Nicola and Alicia - INCREDIBLE, OUTSTANDING, AMAZING!!!!!!!!!!!!! Fabulous projects by the Pinworthies! Love what Autumn, Nicola and Alicia created! 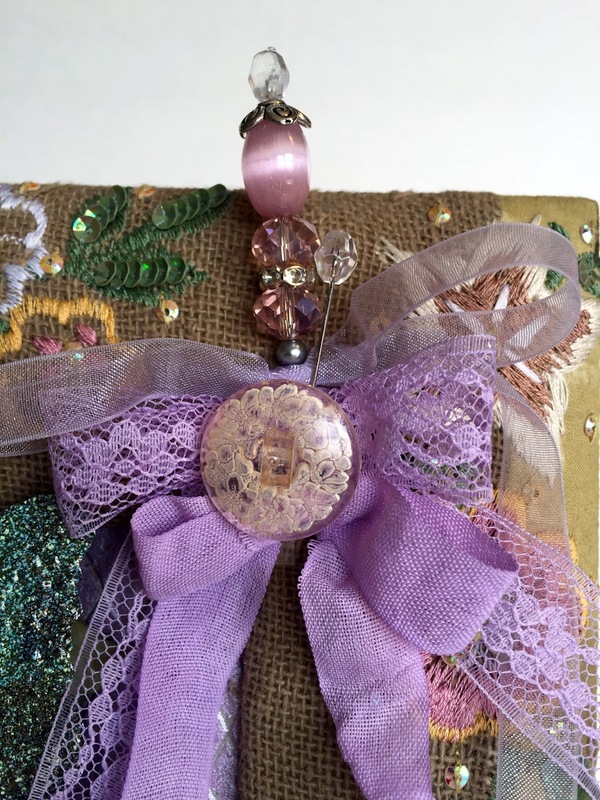 Fabulous Projects by all our Pinworthy Guest Designers. You have truly embraced this months theme. Thank you for sharing your creative inspiration with us all. What fabulous work from the Pinworthies - amazing inspirational use of the contents of the travel bag... wonderful!